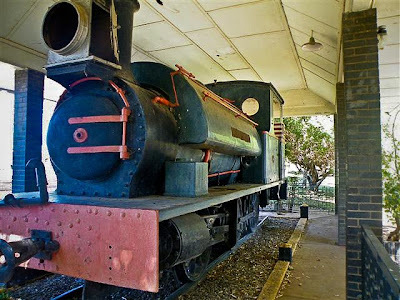 This steam locomotive - the "Nylstroom" - was plinthed at the Nylstroom station building in 1956. These slides were taken in June 1986. On 30th October, 1895, the Government of the South African Republic granted a concession to Mr. Hendrik Jacobus Schoeman for the construction of a railway running from the station at Pretoria West through Warmbaths and Nylstroom to Pietersburg (then a small town), nearly due north of Pretoria and about 176 miles distant. 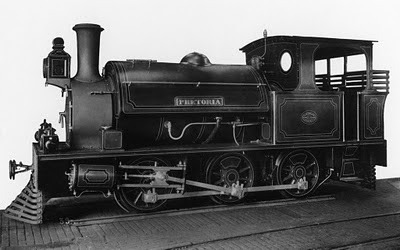 The first (this is incorrect - the 1st loco was the "Pretoria" - Piet) engine purchased by the P.P.R. was the 26-ton, saddle-tank, 0-6-0 type locomotive manufactured by Messrs. Hawthorn, Leslie & Co. during 1896. 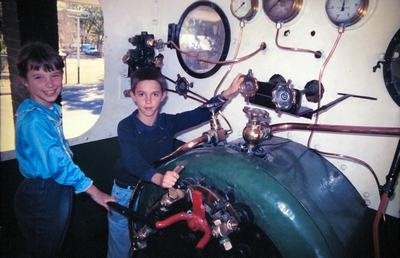 This engine was named "Nylstroom" and placed in service for construction work in 1896. Without a doubt all this beautiful brass & copper work would have long since disappeared! The coupled wheels were 3 ft. 6 in. diameter. The cylinders, 14 in. by 20 in. stroke, were inclined and arranged outside the 7/8 in. 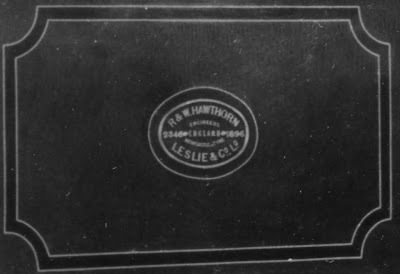 plate frames. The steam chests were arranged between the frames and the slide valves were actuated by Stephenson's link motion, through rocker shafts. The boiler was 3 ft. 4 7/8 in. outside diameter and 8 ft. 10 5/6 in. between tubeplates. There were 130 iron tubes of 1 3/4 in. diameter. The steam pressure was 140 lb. per sq. in. The boiler centre line above rail level was 5 ft. 10 in. The total heating surface was 576.6 sq. ft. and the firegrate area 8.3 sq. ft. The saddle tank had a capacity of 620 gallons and the bunker held 1 1/2 tons. 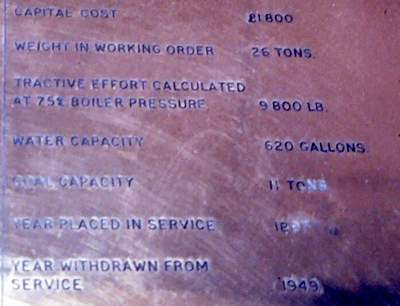 The tractive effort at 75% boiler pressure was 9,800 lb. The "Nylstroom" was in active service until 1949. A recent photo of the "NYLSTROOM". The proper name for the locomotive is The "Nylstroom" and not "Nylstromer". 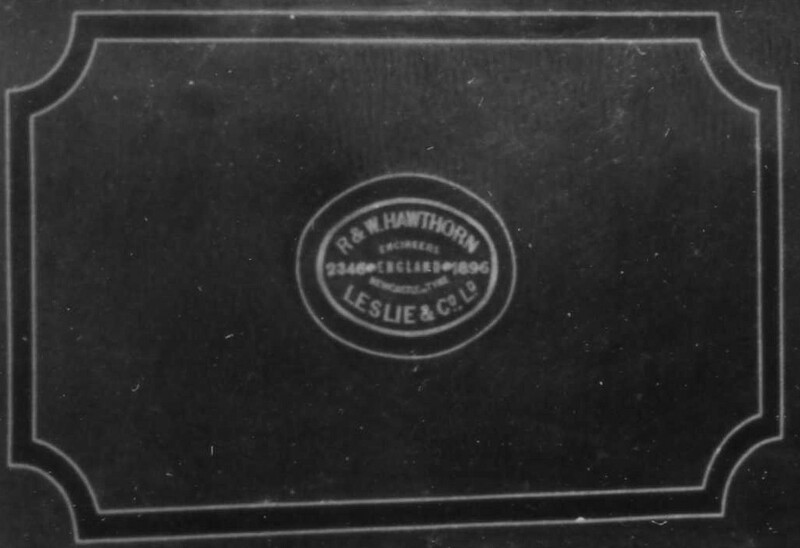 See the copperplate in previous pictures for the name. Photographer unknown. A similar locomotive with a wheel arrangement of 0-6-0 type was named "Pietersburg" and placed into service in 1898. In 1944 this engine was still in service at Pretoria. It then was used mainly for testing the heating systems of trains and for light shunting work. 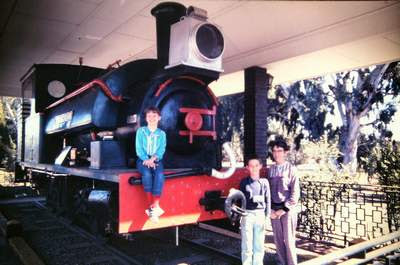 The "Pietersburg" was later plinthed at Pietersburg station. In 1971 Frank Holland noted more correct information in his publication "Steam Locomotives of the South African Railways Vol 1": "The first engines obtained by the PPR were three 0-6-0 saddle-tank locomotives built in 1896-7 by Hawthorn-Leslie & Co, which were named Pretoria, Pietersburg and Nylstroom, works numbers 2346, 2369 ans 2370 respectively. Pretoria was scrapped many years back, but Nylstroom and Pietersburg have been saved for preservation, and are mounted on Nylstroom and Pietersburg stations. As they are of historical interest, they may be declared national monuments." A works photo of the Pretoria. This image kindly provided by Jonathan Palterman from his personal collection. A crop of the previous works photo showing the Pretoria's Hawthorn Leslie worksplate as 2346/1896.